Every doctor wants to know their patients' medical histories. If you want to collect the medical history information and record these data as a pdf, JotForm will help you! 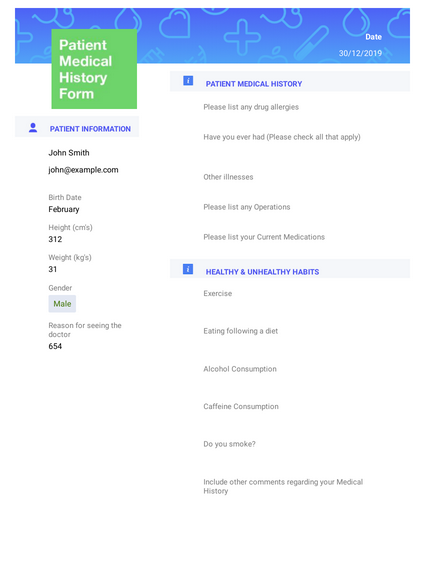 First of all, you can use this medical history form template for gathering your patients' information for instance name, birth date, gender, height, weight, email, their drug allergies, illnesses, operations, medications, healthy & unhealthy habits such as a frequency of exercise, a frequency of alcohol consumption, a frequency of caffeine consumption and a frequency of smoking. Proin leo odio, porttitor id, consequat in, consequat ut, nulla. Sed accumsan felis. Patient intake PDF template is easy for patients to fill out and designed to get the doctor the most important information. Patients can fill out their information on a computer or tablet using our patient intake pdf sample. Medical History Record PDF template is here to help you in order to know the patient's case and previous condition. You can collect data about the patient and medical background with this Medical History Record PDF sample.